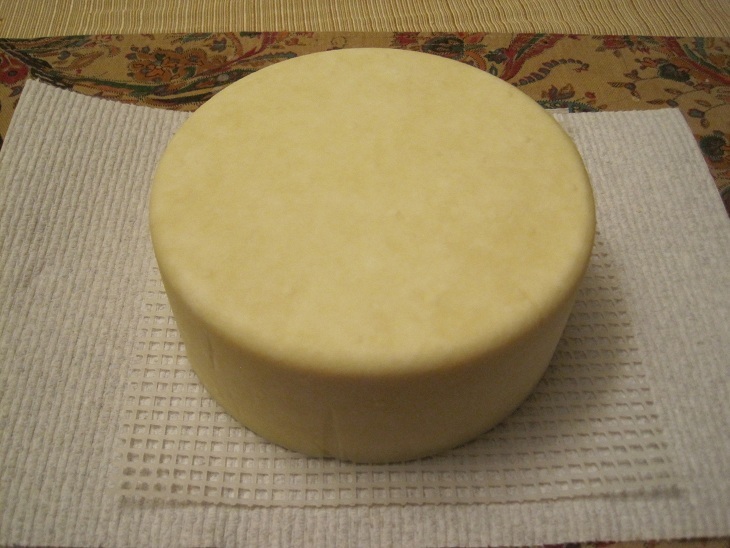 I used the recipe from Ricki Carroll’s Home Cheese Making book with some minor modifications. 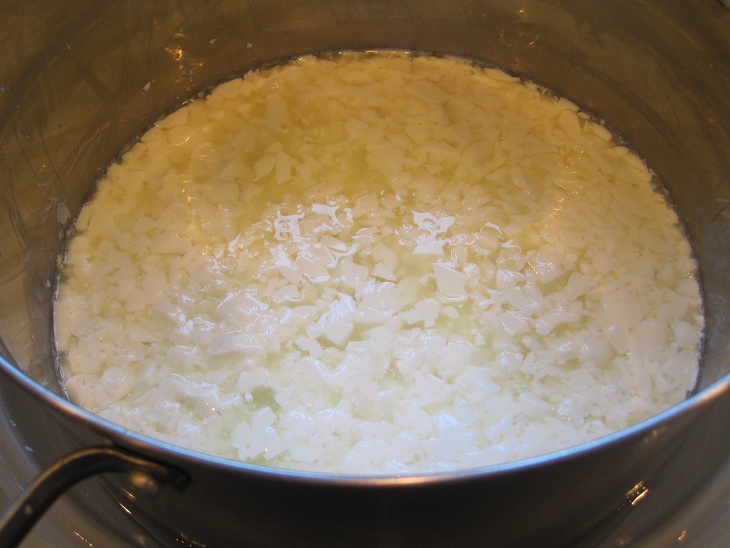 First, I gathered everything I thought I would use, put them into my cheese pot, and boiled them for sterilization. (Inevitably, I forget something. That’s what bleach spray is for.) 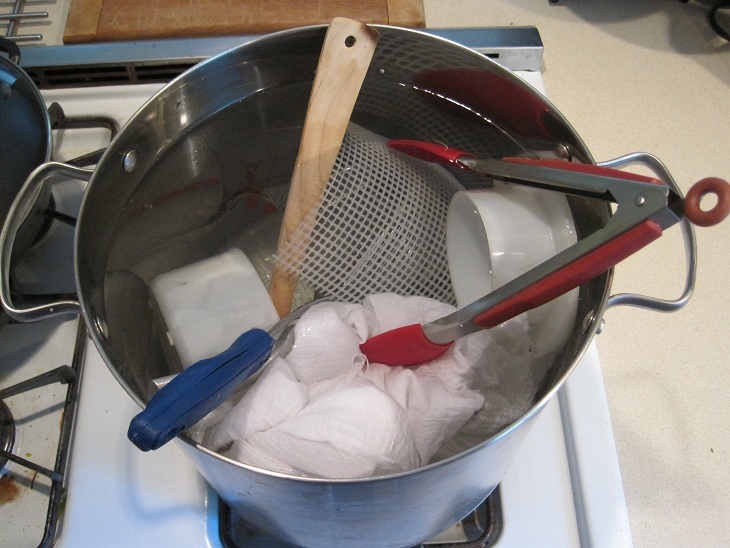 This is a wooden spoon, wire basket, cheese mold & follower, cheese mat, butter muslin, a 1-cup measure, curd knife, and tongs. While this was boiling, I cleaned the counters and put down paper towels to put all the clean stuff on when it came out of the pot. Using other tongs, I extracted the sterile tongs. When the sterile tongs were cool, I used them to take out everything else. Then I emptied the nearly-boiling water out of the pot and waited for the pot to cool. 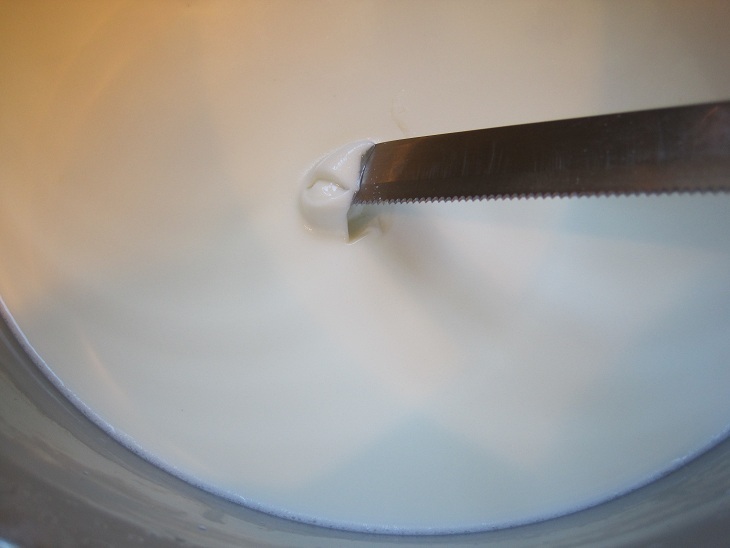 When it had, I added 2 gallons of good whole milk and stirred in 1/2 tablespoon of calcium chloride diluted in a half a cup of non-chlorinated water. The recipe didn’t mention stirring, but I stirred slowly most of the time to distribute the heat evenly and discourage clumping. 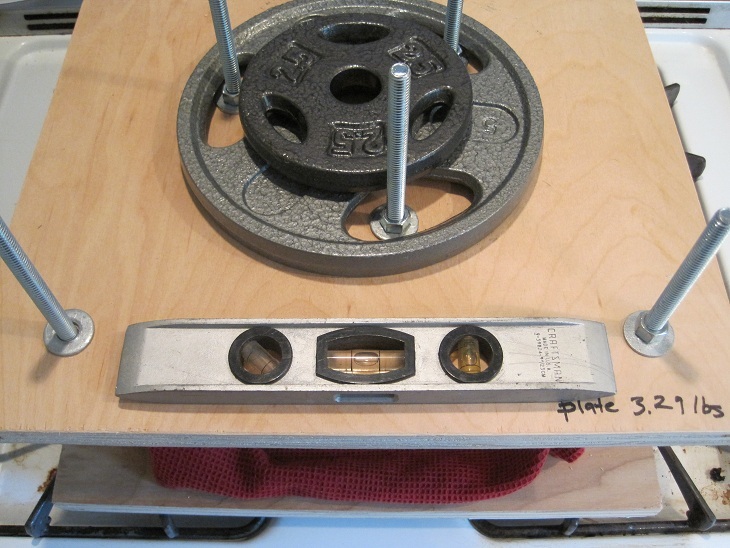 And eventually, ta-da! 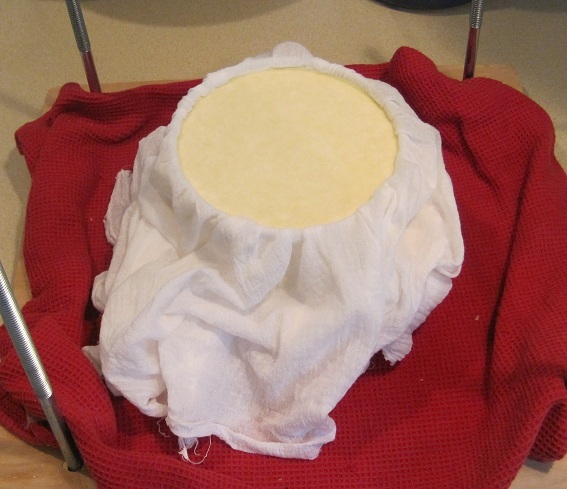 I lined my cheese mold with muslin and transferred the curds into it using a wire basket. 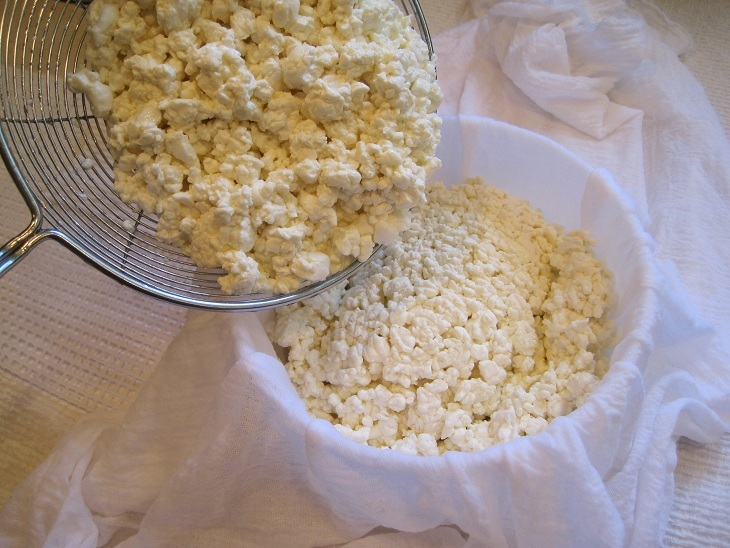 With previous cheeses, the curds first go into the muslin to drain for a period of time, then salt is added before they go into the mold. 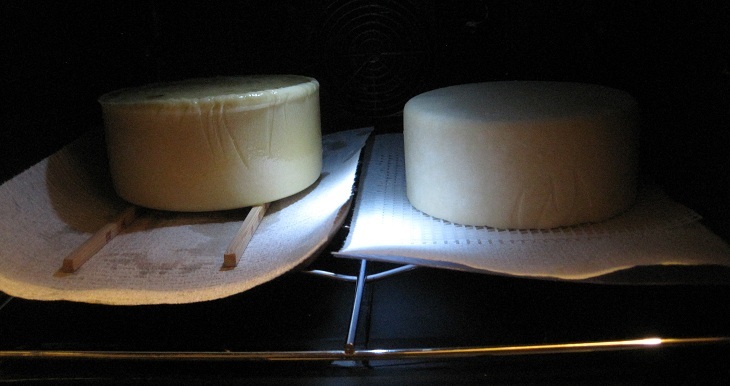 This type of cheese just goes directly into the mold — which means it is very wet and not at all compacted. 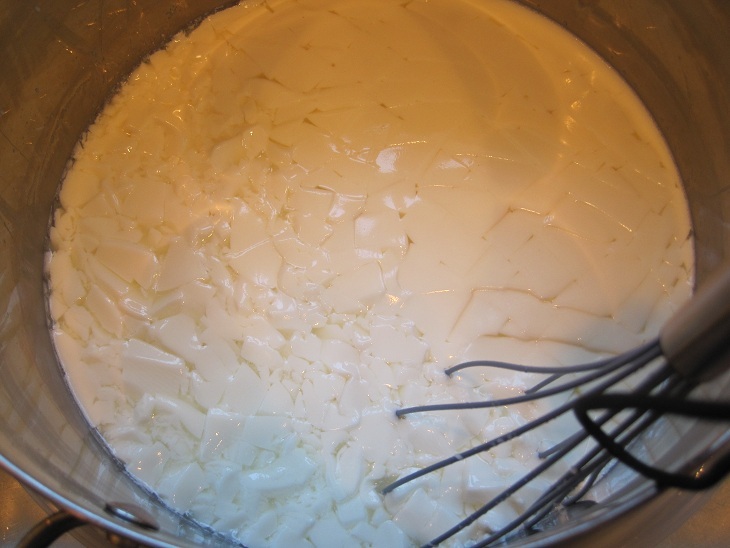 I ended up packing the curds into the mold over the sink and pressing them in with my hands so they would all fit, while a lot of whey drained out. It was brining time. 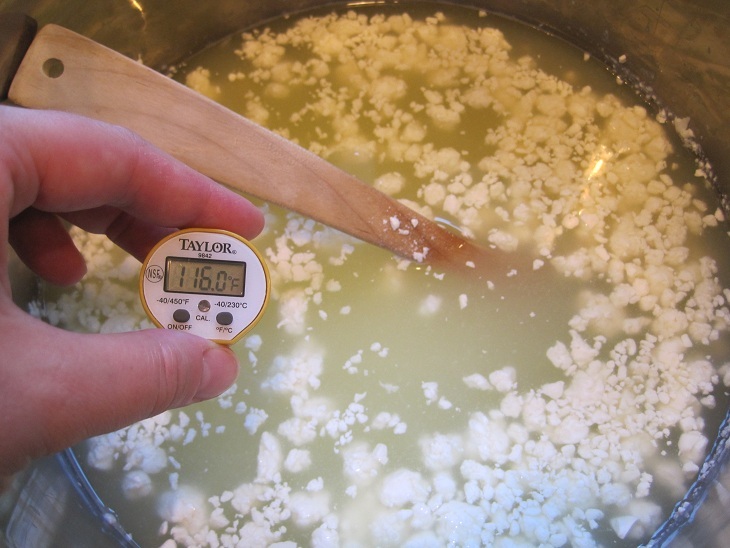 We already had a brine solution (essentially, non-chlorinated water saturated with cheese salt) so I boiled it to kill off any bacteria, then chilled it back down to fridge temperature before plopping the cheese into it. 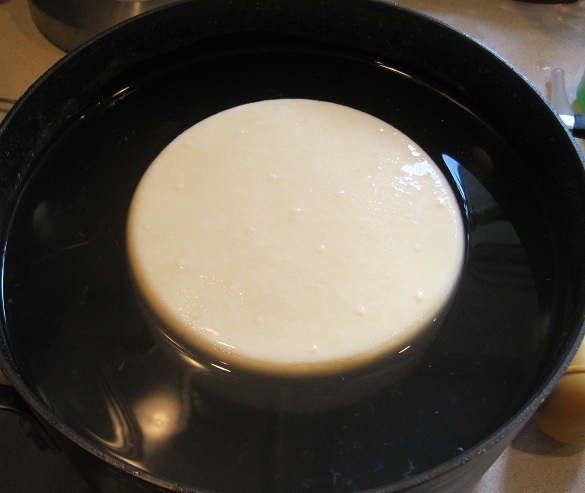 After 12 hours in the brine, I took the cheese out and patted it dry. Now it needs to be flipped every day for a few weeks and occasionally after that. In two months, it will get rubbed with olive oil. Then it should age 4 months or more before we try it. I can’t wait! 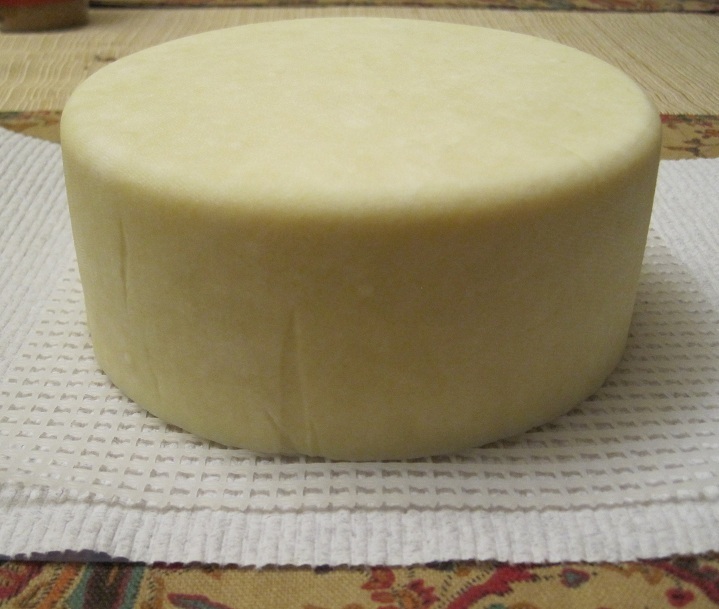 Well done, that is a nice looking cheese.